I know this is usually a very light-hearted blog, but every once in a while I run across an issue that I can't help but talk about. 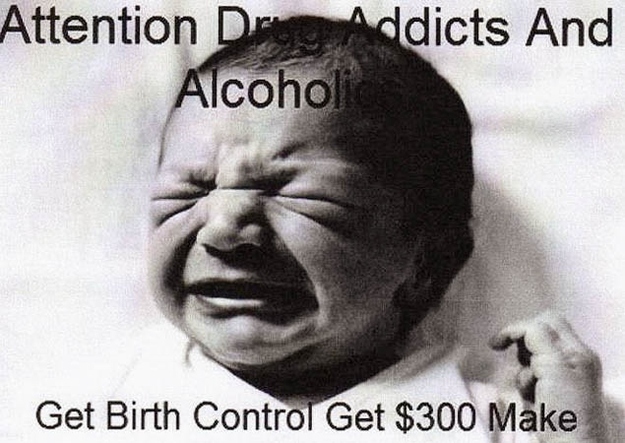 The topic at hand is whether or not it is ethical to pay drug & alcohol addicted women $300 to get sterilized? The organization Project Prevention offers drug addicts (mostly women) $300 cash if they agree to sterilization or long-term birth control. Founded in North Carolina, the program has expanded to the UK and hopes to work in Kenya, Ireland, and Haiti. There are accusations that Harris focuses specifically on black women, and others who say that Harris views all addicts as “eternal victims,” and doesn’t seem to give a care what happens to these women as long as unwanted babies are not born. As a father of two who lives in a small town with plenty of poverty, alcoholism and drug addiction, I think it's an excellent idea. Moreso, my wife used to work as a case manager for community services, and the horror stories she would come home with regarding neglected children were simply heartbreaking. As a matter of fact, I think men should be targeted just as much as the women (it takes 2 to play, after all). As for the ethical dilemma of giving cash to drug addicts; they will find a way to get the drugs no matter what - never in the history of mankind has a drug addict declared; "well, I'm plum out of cash, guess I'll get clean today". While I am certainly not in favor of genocide, I don't believe that it should be forced on anyone. I think this group has the right idea, but I would to see them reach out to males just as much as females.